You might have noticed that a new Star Wars movie was released in theaters this past weekend, complete with a new droid called BB-8. 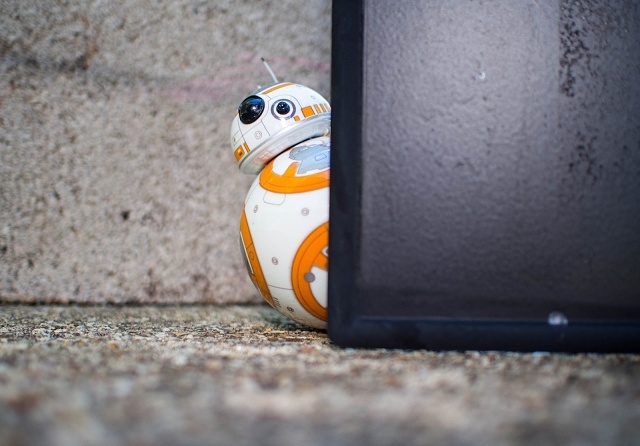 I'm a sucker for cute droids, and decided we should definitely give away the super awesome little BB-8 droid from Sphero to one of our readers! If you haven't already read Russell's review of the droid, you'll definitely want to check it out, right after you enter to win one for yourself! One lucky winner will receive a BB-8 droid by Sphero. You have two ways to enter. Just log in and leave a comment below, then head over to the blog post and leave a comment there too, and you've earned two entries! No spoilers please, if you've seen the movie! The contest is open worldwide so anyone can enter. Please remember that the prize will ship from the U.S. and any charges incurred at customs are the responsibility of the winner. One entry per person please. If we catch you spamming you will be eliminated from the competition. We'll keep this open until the end of the month and announce the winner on the blog the first week of January. May the force be with you. rockford, johnnybabble1976, NikOnJava and 45 others like this. yes please!! that thing looks like a blast. Would be a neat toy! Seeing the movie just makes you want a BB-8 that much more. Which is a search results page, and the searched term is "forums androidcentral com sphero bb 8 624230 contest win your very own bb 8 remote control star wars mini droid android central" which has no results. Oh and in it to win it! Looking forward to winning this little droid I've been looking for. The Sphero BB-8 looks like fun. Thank you for running this contest. Sphero and Star Wars, what a great combination! Kids would love this! So would Daddy! Why does my Galaxy Note S4 consistently disconnect and reconnect from my home WiFi network? Where are settings for moving pictures from S5 phone to SD card?